Here's the scenario: you're a small community ED on a late Sunday morning. Let's say a middle aged gentleman walks in your door, complaining of left eye pain and loss of vision after blunt trauma to the area. Let's say the local Nelson Muntz threw a rock at his face. Haw haw! On exam, he has proptosis of this eye, with significant chemosis. His visual acuity is 20/20 in his unaffected eye but is virtually nonexistent in the affected eye (he has light perception but that's about it). He has severe limitation of his extraocular muscles. 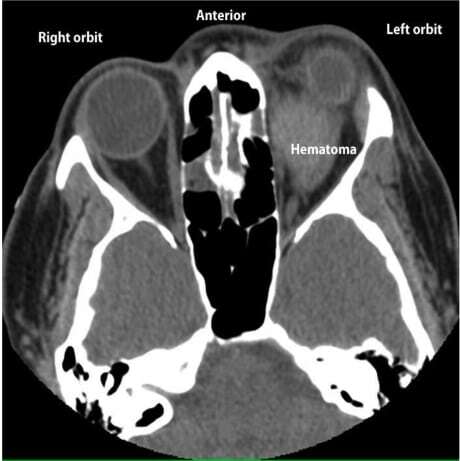 You order a CT of his orbits, and it reveals a retrobulbar hemorrhage. You grab your TonoPen and check pressures, and it's off the charts. There is no ophthalmologist in house, and it will take up to an hour for him/her to get there. Better get out your scissors, doc, because you're about to do a lateral canthotomy. In recent months I've asked multiple providers about which procedures make them squirm and this one often makes it to the top of their lists. In the end it's not a terribly complex procedure, but there's something about cutting around the eyeball that is inherently unsettling. However, these patients have a compartment syndrome of the eye (involving the globe, the ophthalmic artery, and the optic nerve), and it is your job at this point to prevent the patient from having permanent vision loss. The setup is minimal and brief, as time = retina in this situation, and if the specialist isn't going to be in for a while you're responsible for this one. The literature suggests that after the initial loss of vision, you have about 120 minutes until the loss is permanent. Quickly throw a few cc's of lido with epinephrine into the lateral canthus, and then squeeze it with a hemostat to reduce bleeding. Then snip through the canthus toward the orbital rim. Pull down and locate the inferior crus of the lateral canthal ligament (this is the cantholysis of the procedure, visualized with the cadaver image below). Recheck your IOP at this time--if it's still elevated you can snip the superior crus as well. If done properly the lower lid should fall away from the lid margin. Often patients have dramatic improvement in vision but it's possible that this may take longer to return (assuming you've cut in time to save the structures). Just like other facial wounds they tend to heal well without any significant scarring. Regardless, now you'll really need the specialist for a definitive closure. Here's a fantastic video courtesy of Dr. Larry Mellick (who is now also following the site!). As always, these posts are for EDUCATIONAL PURPOSES ONLY. Don't go chopping up eyeballs ha-ha-ho-ho after one quick glimpse at this site (also a small prize to anyone who gets the reference I just dropped there). Lateral Canthotomy & Cantholysis at Emerjency Webb. Robers and Hedges' Clinical Procedures in Emergency Medicine. Chapter 62. Ballard, S. R., Enzenauer, R. W., O'Donnell, T., Fleming, J. C., Risk, G., & Waite, A. N. (2009). Emergency lateral canthotomy and cantholysis: a simple procedure to preserve vision from sight threatening orbital hemorrhage. Journal of Special Operations Medicine : a Peer Reviewed Journal for SOF Medical Professionals, 9(3), 26–32. Vassallo, S., Hartstein, M., Howard, D., & Stetz, J. (2002). Traumatic retrobulbar hemorrhage: emergent decompression by lateral canthotomy and cantholysis. Journal of Emergency Medicine, 22(3), 251–256.